Our way to let you find your way to and around Potchefstroom (Municipality of Tlokwe). 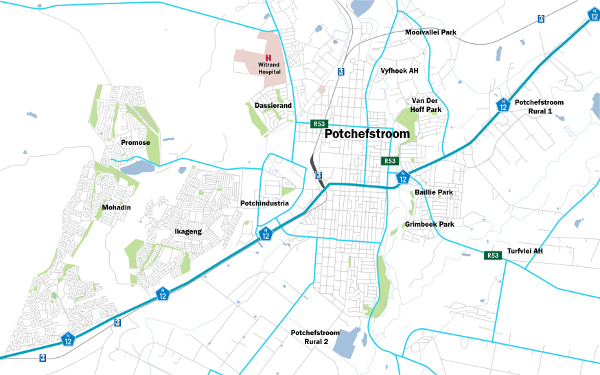 Potchefstroom Gateway is your comprehensive guide to Potchefstroom - it's Businesses, Accommodation Facilities, Places and People. Potchefstroom is situated 130 km South West of Johannesburg and 320km North East of Kimberly along the N12 Treasure Route. Potchefstroom is one of the biggest cities in the North West Province of South Africa; Potchefstroom is mostly referred to as “Potch”. There’s a lot more than just the size of Potchefstroom, it’s also the location of the North West University, known as PUKKE. NWU attracts a lot of students and the city is commonly known for its sport facilities, Aardklop festival and student life, because of the location Potchefstroom also attracts a great amount of tourists due to the Aardklop Festival and also the Vredefort Dome. A lively Town it would seem to be. According to Tlokwe City Council, Potchefstroom has approximately 250 000 people. Average temperature of 29.83 maximum degrees Celsius and minimum 1.56 degrees. Its 1343 meters above sea level. The yearly Aardklop Arts Festival has been hosted by Potchefstroom since 1998. More than 150,000 visitors are attracted by the festival every year. The festival occur in late September beginning October each year – where you can see live music shows, stage performances (drama, play) and lots more. 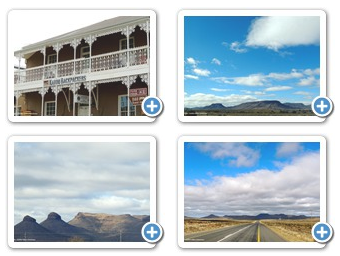 The N12 Treasure Route is the alternative to the N1 to travel from Gauteng Province to Cape Town and or George. Three buildings, which constitute a formal unity around a traffic cycle. These buildings have all been built according to the so-called Traditional Style, in which there is a striving for monumentality without using the conventional Classicist formality. The essence of Classicism was achieved visually by means of the form of the structure and other stylised elements. The portico of eight giant columns lends monumentality to the Main Building. Opened on 23 April 1919, it was initially offered space in wood and corrugated iron buildings on the grounds of the High School for Boys. In 1920 the College was transferred in its entirety to the former Cantonments, and in 1923 the move was made to the present site in President Street. In one such complex of corrugated iron buildings the male students were accommodated - in 1932 they dubbed their residence "Radium Temples". Female students have lived in Oakdene (the extended residence of former State President MW Pretorius) since 1925. Permanent buildings of the College were built in the subsequent years i.e. Van Heerden House in Hoffman Street, 1929 - Barnard House and a central dining/recreation hall, 1949. The main building and Ratau, Lebone and Mea Mater were occupied in 1954. Today part of the NWU Campus. The longest oak avenue in Southern Africa, Potchefstroom Oak Avenue of 6.48km comprises Chris Hani Drive, Kock St, Dr Beyers Naude Ave, Retief St, Peter Mokaba, Steve Biko and Calderbank Avenues. It stretches from the Agricultural Centre to the Lakeside Resort. The Town Council of Potchefstroom planted the trees following a decision in 1910. A stone beacon with bronze plaque was erected on the corner of Lombard and Kruger Street after the avenue was declared a national monument in 1975. Beacon constructed with stones from the old North Bridge. Used by former homeland / traditional leaders such as Lucas Mangope, Dr. Phatudi, TK Mopedi, Wessels Mota, and Kaizer Matanzima to address their respective subjects who lived in Ikageng. Residents were informed about the developments in the homelands as well as to continually instil cultural awareness on them. Memorial clinic in honor of an anti-apartheid political activist who disappeared without trace in 1986 following the Ikageng Uprisings. Click map to see high quality version.